Short answer: Yes, they are. Long answer: Unfortunately, we can't prevent users from doing any changes to their signature in their Gmail Settings. The default option is set to "Manually". 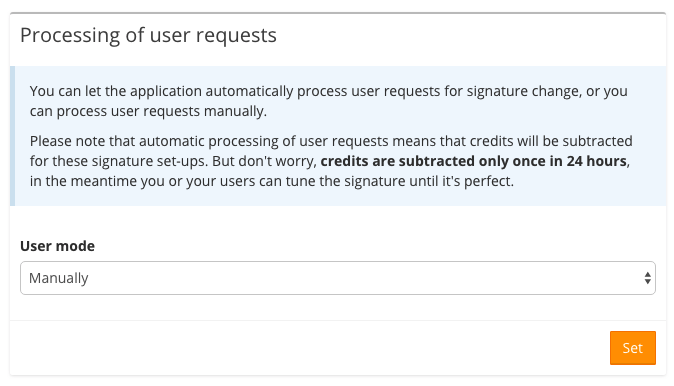 If you change it to "Automatically", and your users perform any changes in the User form, these changes will be automatically reflected in their signature. But be careful! If you use credit system, you'll be charged for this action. There's also a possibility that the user might do inappropriate or othwerwise harmful changes, so unless you trust your users completely, we suggest keeping the option set to default and review the requested changes manually.